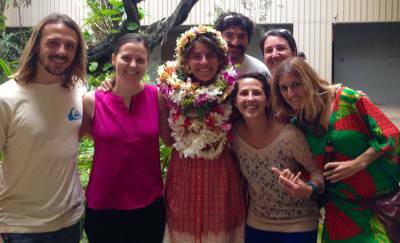 Mariana Rocha de Souza advanced to candidacy this week and passed her qualifying exams! Congratulations, Mariana! She was also awarded the STRI Smithsonian Short Term Fellowship! This summer she will be studying Symbioniaceae in Bocas del Toro, Panama. Congratulations to Dr. Chris Wall for successfully defending his dissertation! Great job! We are so excited for you! 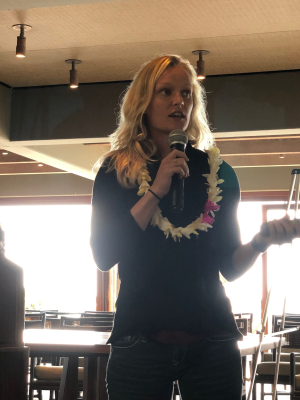 PhD candidates Beth Lenz and Ariana Huffmyer presented their research and the work of Dr. Ruth Gates' lab to the Honolulu ARCS Chapter. 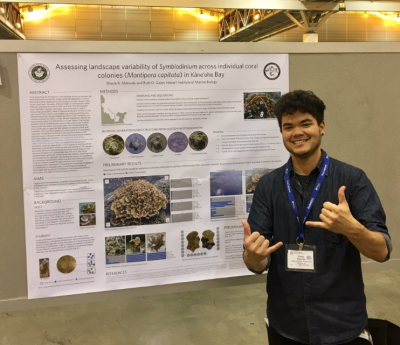 PhD candidate Shayle Matsuda presented his research on the effects of thermal stress on four Hawaiian coral species at the Society of Integrative and Comparative Biology conference in Tampa FL. 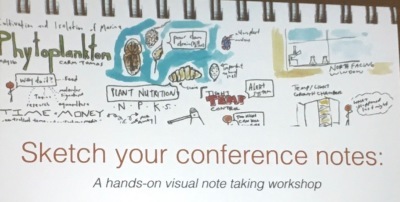 He also presented a workshop on sketch noting! 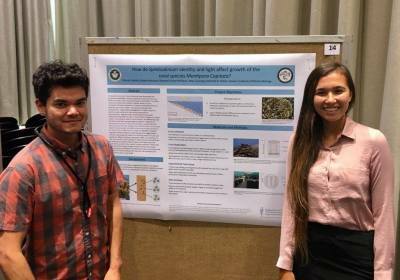 Dr. Ford Drury and Kira Hughes both presented research at the Reef Futures Symposium in Key Largo, FL. 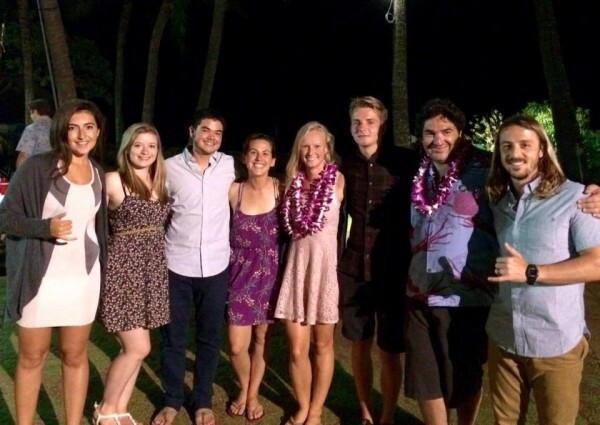 They also met up with some familiar faces that we miss having with us in Hawaii! Congratulations to Carlo Caruso for passing his comprehensive exams and advancing to PhD candidacy! Well done, Carlo! 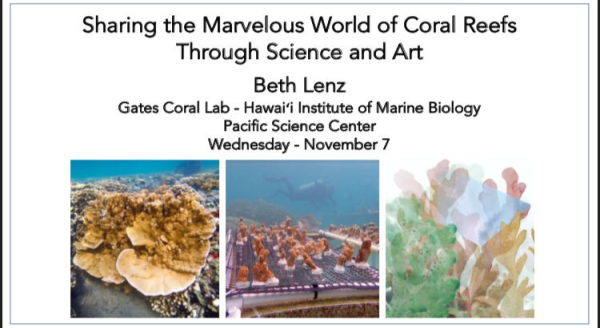 Beth Lenz presented her work Sharing the Marvelous World of Coral Reefs Through Science and Art at the Pacific Science Center to highlight the art and science collaboration we are doing in Honolulu. 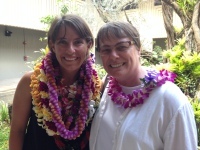 Beth Lenz with Carolina Chambers, the Portal to the Public Project Coordinator at the Pacific Science Center. 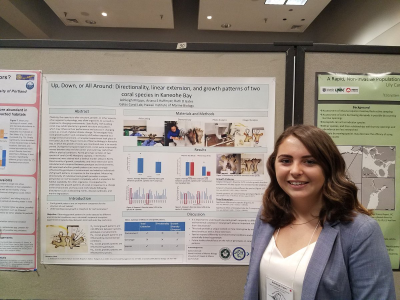 PhD Candidate Beth Lenz and undergraduate students Mariah Opalek and Ashleigh Epps shared their research at the Western Society of Naturalists Annual Meeting in Tacoma Washington. 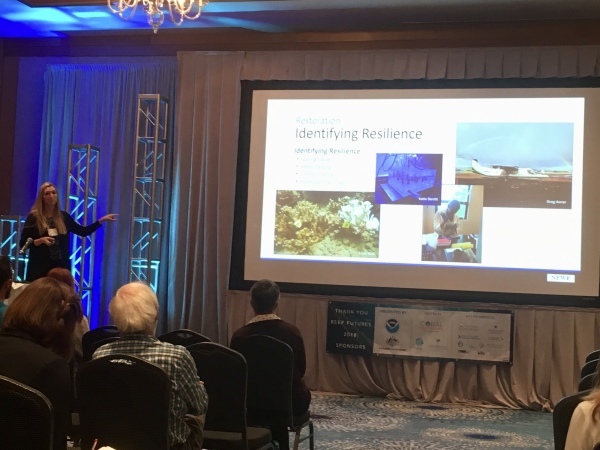 Beth also presented the science and artists collaboration between local artists and HIMB researchers that she has been working on, supported by the Rafe Sagarin Innovative Ecology Award. 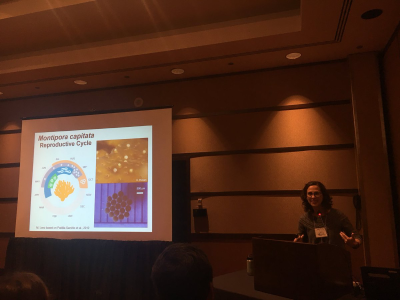 Beth Lenz also presented her research on Reproductive plasticity and parental effects in a Hawaiian reef-building coral under ocean warming to Paul Allen Philanthropies in Seattle in addition to her talk at the Western Society of Naturalists Annual Meeting in Tacoma. 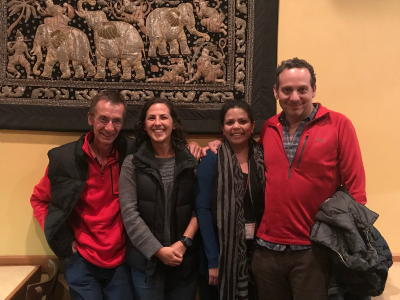 Dr. Peter Edmunds, Beth Lenz, Dr. Jackie Padilla-Gamiño, and Dr. John Bruno at the Western Society of Naturalists Meeting in Tacoma. 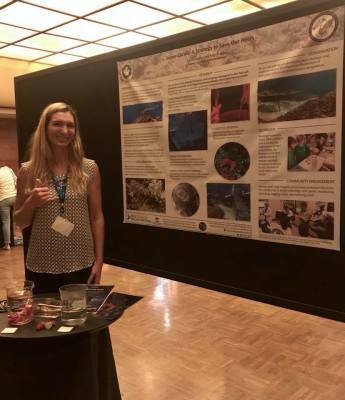 Coral Assisted Evolution Project Manager, Kira Hughes, presented Gates Lab research and a coral bleaching outreach activity at the National Marine Educators Association 2018 conference aboard the The Queen Mary in Long Beach, CA. 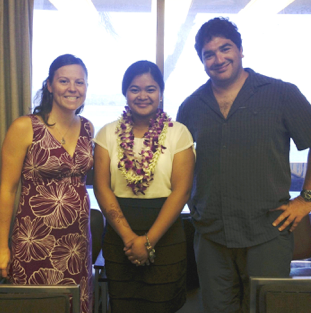 She is also a Co-Chair for NMEA2020 with OCEANIA Marine Educators Association in Honolulu, HI. The Gates Lab hopes to see you there! 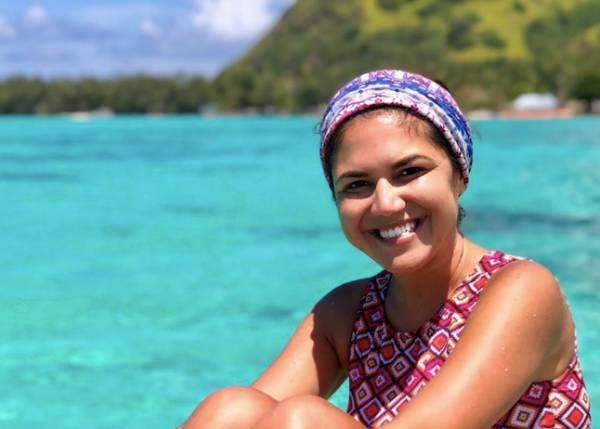 Gates Lab PhD student, Mariana Rocha de Souza was awarded grant funds from the CLEAR REEF Social Fund for Marine Research and Conservation to support her dissertation research. 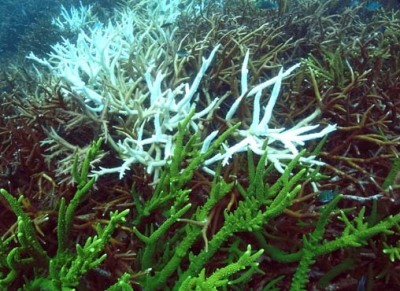 The CLEAR REEF fund is intended to promote local initiatives being brought forward by regular citizens (students, researchers, unemployed, retirees, or any person of good will) seeking a financial help to run a project directly or indirectly related to marine research and/or conservation. 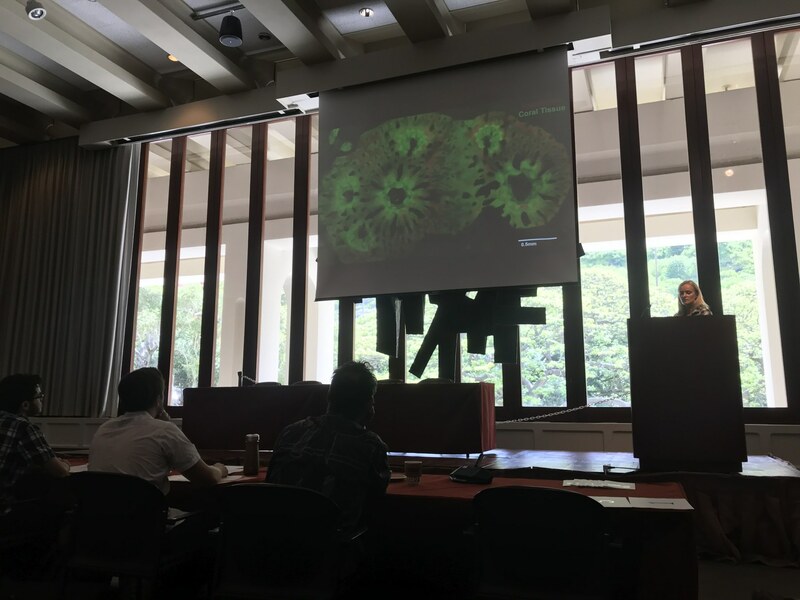 Congratulations to all Gates Lab members for the excellent presentation of their work at the 2018 Albert L. Testers Memorial Symposium at UH Manoa. We would also like to congratulate PhD candidates Shayle Matsuda and Chris Wall for their hard work in assisting with the organization and hosting of this year's symposium. 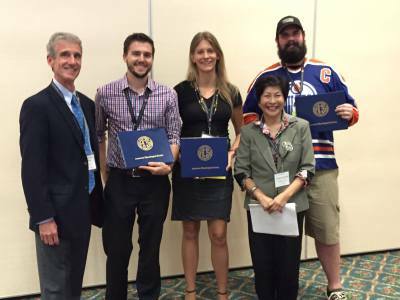 Gates and Lemus Lab PhD candidate Ariana Huffmyer recieved a Best Graduate Paper award for her presentation. Well done! Congratulations to Gates and Lemus Lab PhD candidate, Ariana Huffmyer, for recieving the PEO Scholar Award. This award is a competitive fellowship awarded by the international chapter of the Philanthropic Education Organization. 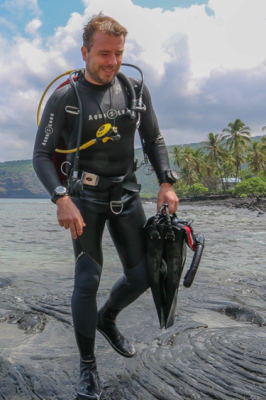 Please join us in congratulating Gates Lab post-doc, Dr. John Burns, who will take on a new role as Assistant Professor of Data Science in Marine Science at UH Hilo this August! Congratulations to our high school volunteer, Dyson, who has been selected as a youth ambassador for Philippe Cousteau, Jr.'s EarthEcho International! 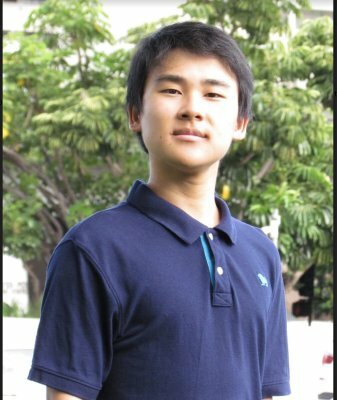 Dyson was also recently accepted in the Hawaii Institute of Marine Biology Research Experience in Marine Science (REMS) Summer Program! Way to go, Dyson! 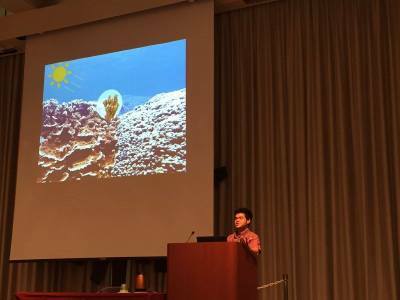 Gates Lab PhD candidate, Shayle Matsuda, attended the Kavli Foundation's "Support System for Scientists' Communication and Engagement, Workshop 3: Academic Institutions" program at UC San Diego Scripps Institution of Oceanography. 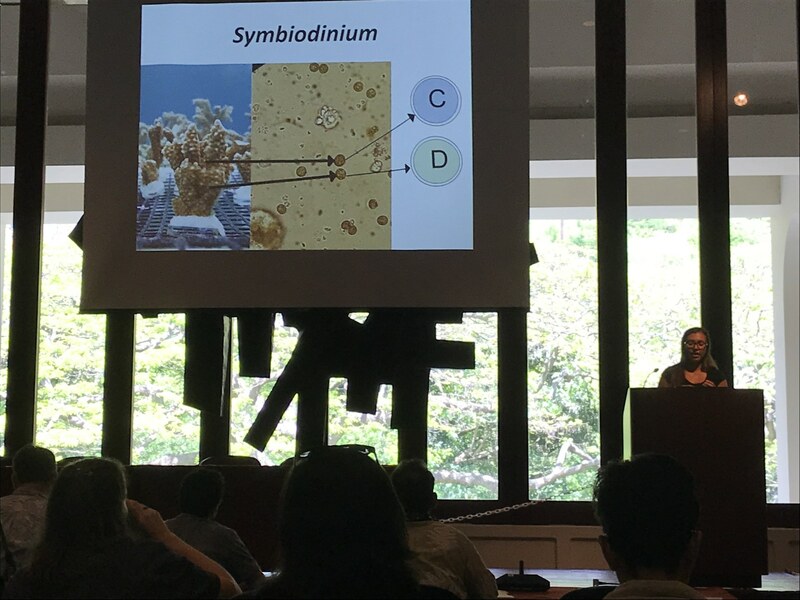 Gates Lab members Shayle Matsuda, Elizabeth Lenz, Mariana Rocha de Souza, presented an overview of their research at the 2018 HIMB Scholarship Symposium. 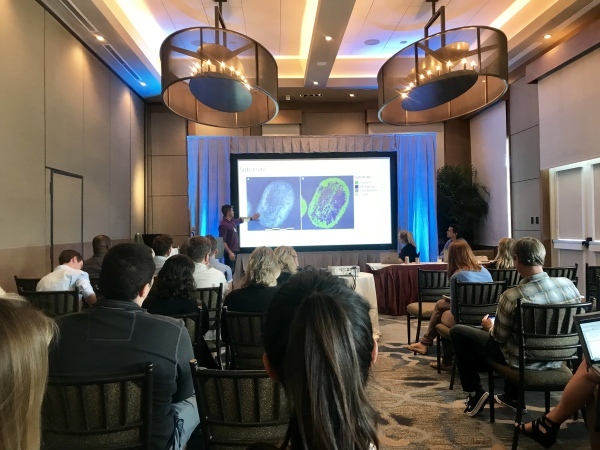 Gates Lab intern, Mia Melamed, attended the 2018 Ocean Sciences Meeting in Portland, Oregon. 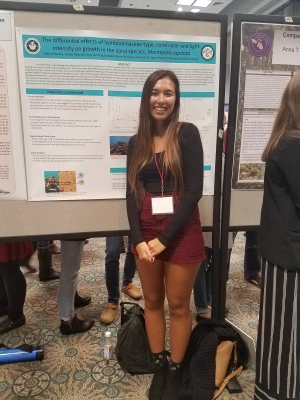 She presented a poster of her past research, "The Fork to Food of a Littorinid: "Do littorinids smell odors released by macroalgae to find food?". Congratulations Mia! Congrats to Gates Lab Postdoc, John Burns, on receiving an NSF Postdoctoral Fellowship! 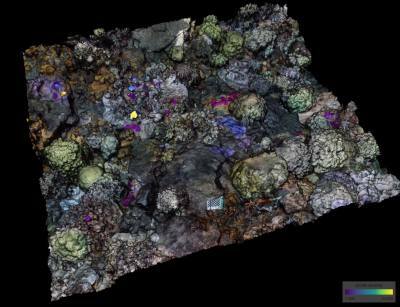 This two-year fellowship will use 3D reconstruction techniques to enhance our understanding of the biology and ecology of Hawaiian ecosystems. Stay tuned for exciting results from this project! 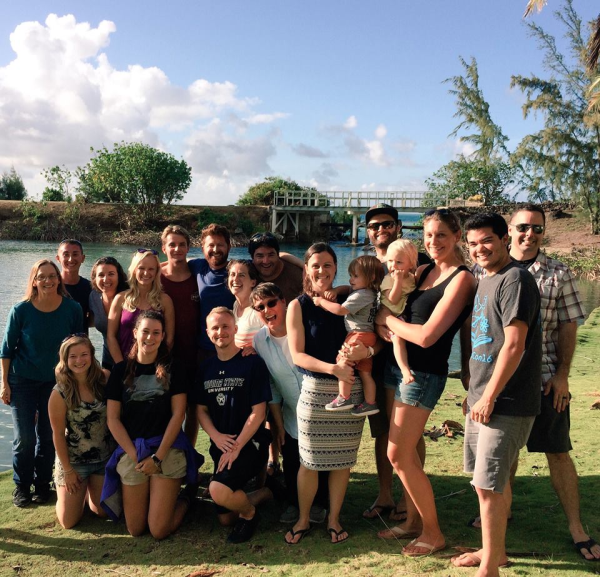 Gates Lab members Chris Wall, Beth Lenz, and Ariana Huffmyer recieved funding support from the HIMB Colonel Willys E. Lord, DVM & Sandina L. Lord Scholarship Fund to support their research! Congratulations! 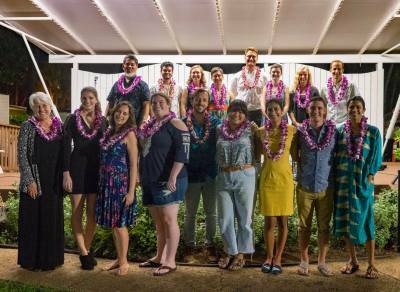 PhD student Beth Lenz organized and co-led a Science Communication workshop at HIMB with 9 participants from graduate students to faculty level. Three guest speakers attended the workshop from local news media and improvisation groups. 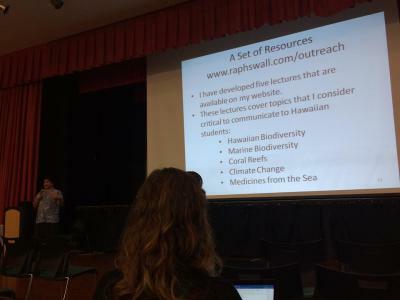 PhD student Beth Lenz was a speaker at the SOEST Open House Voice of the Sea Meet 'n Greet Session in Honolulu HI. She spoke with community members during a Q&A session about research in the Gates Lab. The Gates Lab welcomed a visit from the Delegation from the Congressional Higher Education Committee. Dr. Raphael Ritson Williams and Beth Lenz attended the XIth International Larval Biology Symposium. 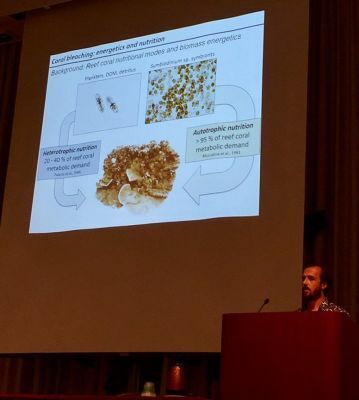 Raphael was an invited plenary speaker for the symposium on Microbiomes in the Sea: Larval-bacterial Interactions. 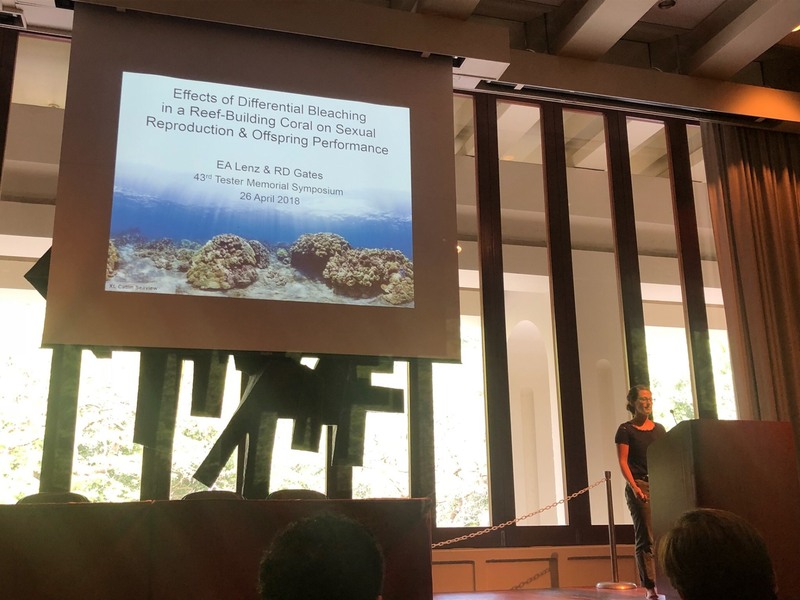 Beth Lenz presented her research on the impacts recent bleaching events on coral sexual reproduction and offspring performance. Beth received Honorable Mention for Best Student Talk. The Gates Lab would like to give a special thank you to Dr. Raphael Ritson-Williams for his many contributions to the lab during his time as a PhD student. Dr. Ritson-Williams is starting his new position as a post doctoral research fellow with the Hope for Reefs Initiative at the California Academy of Science. We wish you the best of luck and are excited for future collaborations! 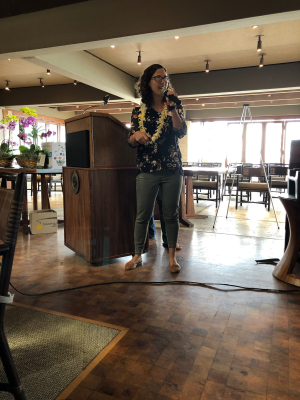 Project Manager Kira Hughes was invited to present our Coral Assisted Evolution project at the 1st Annual Hawaii Coral Nursery & Restoration Workshop. Attendees included representatives from federal and state agencies in addition to academics, community organizations, and other local stakeholders. Congratulations to Raphael Ritson-Williams for successfully defending his PhD dissertation! 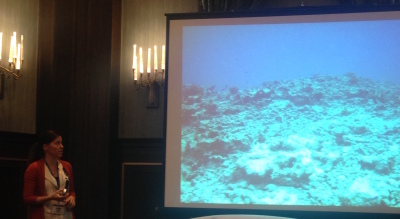 Raphael gave an excellent talk on his PhD research in the role of variability in coral reef resilience and recovery. Well done, Dr. Ritson Williams! The Gates Lab would like to recognize and thank Dr. Katie Barott for her enormous contributions to the Gates Lab during her time as a Post-Doc. She has greatly advanced the research program of the lab and will continue to be a valuable collaborator. Dr. Barott is starting in her new position as an Assistant Professor of Biology in the Department of Biology at the University of Pennsylvania (https://www.bio.upenn.edu/people/katie-barott). Please join us in congratulating Dr. Barott on her new position and wishing her all the best! You will be missed and we look forward to continuing our collaborations with you! PhD Candidate Beth Lenz returned from her internship with US Geological Surveys St. Petersburg Coastal and Marine Science Center where she is conducting research that compliments the USGS Coral Reef Ecosystems Studies (CREST) by assessing fecundity and Symbiodinium communities in Porites astreoides along the Florida Reef Tract after a major bleaching event. Last Day in the Field at Dry Tortugas National Park. 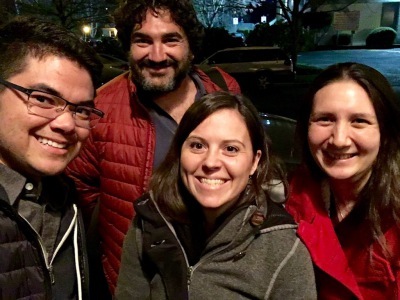 (Left to Right): Anastasios Stathakopoulos, Beth Lenz, BJ Reynolds, Lucy Bartlett, and Ilsa Kuffner. 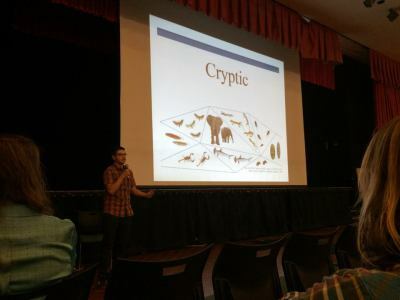 Gates Lab PhD candidate Raphael Ritson-Williams was recognized by the Graduate Instruction Committee as the UH Manoa 2016 Zoology Graduate Student of the Year! Congratulations Raphael! Gates Lab graduate students Ariana Huffmyer and Beth Lenz passed their rigorous comprehensive examinations. Congratulations on becoming PhD Candidates! 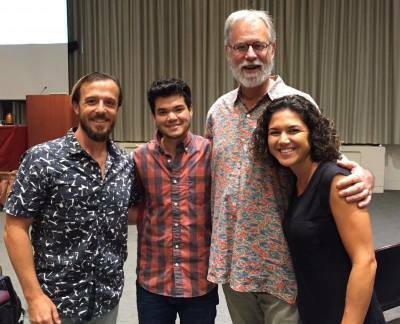 PhD students Mariana Rocha de Souza and Shayle Matsuda, PhD Candidate Chris Wall, and undergraduate student Mariah Opalek presented their research at the University of Hawaii at Manoa 42nd Annual Albert L. Tester Memorial Symposium held by the Biology Department. They all did an excellent job! Congratulations to Shayle Matsuda and Chris Wall for both being awarded best presentation! Drs. 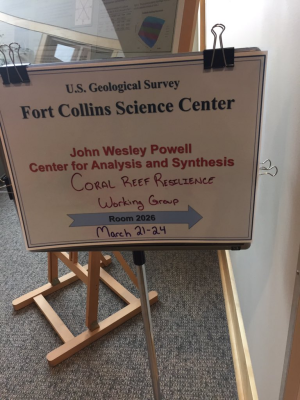 Ruth Gates, James Guest, Hollie Putnam, and PhD Student Beth Lenz visited the USGS John Wesley Powell Center for Analysis and Synthesis in Ft. Collins, Colorado for the second workshop investigating the "Local-scale ecosystem resilience amid global-scale ocean change: the coral reef example". 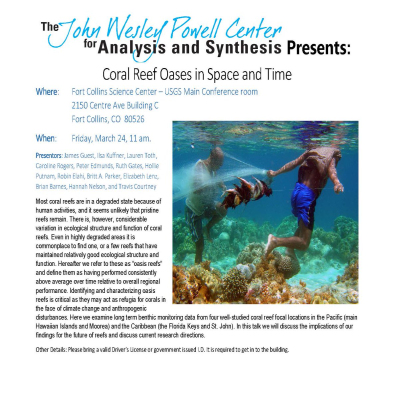 At the end of the workshop, James and members of the group gave a public talk titled, "Coral Reefs in Space and Time". 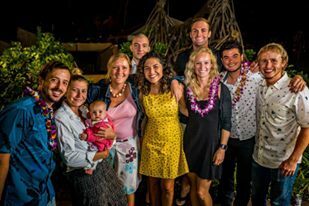 Members of the Gates Lab presented the results of their research at the 2017 American Society of Limnology and Oceanography conference in Honolulu HI. 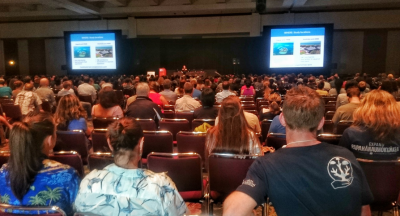 Dr. Ruth Gates discussed harnessing basic science to advance solutions for coral reef in her plenary talk at the ASLO meeting. 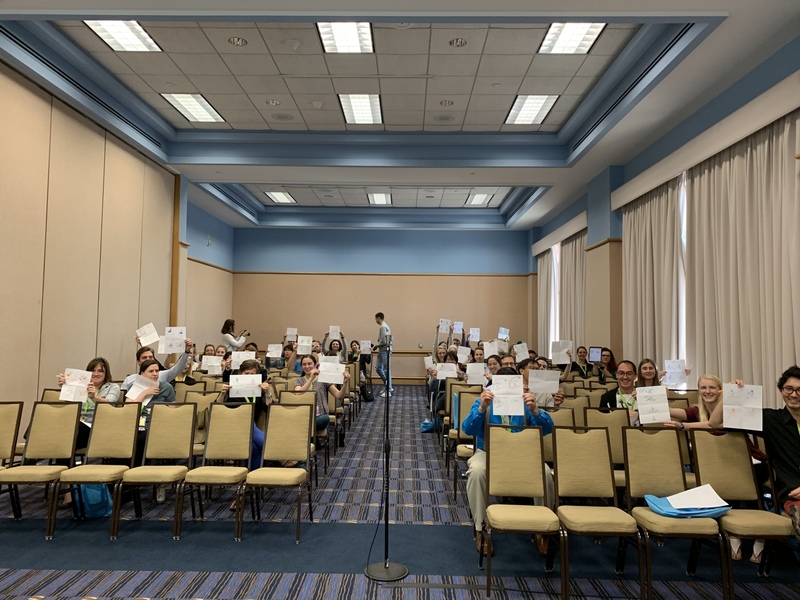 Congratulations to Chris Wall, Shayle Matsuda, Ariana Huffmyer, Beth Lenz, Dr. Ouida Meier, Dr. Katie Barott, and Dr. James Guest on their successful presentations! 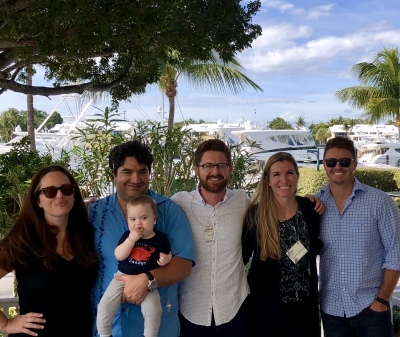 The Gates Lab would like to congratulate Dr. Ross Cunning on his new postdoctoral position at Rosenstiel School of Marine and Atmospheric Science at the University of Miami. Thank you, Ross, for your leadership, enthusiasm, and enormous contribution to our research group. We look forwad to our future collaborations with you! Join us on congratulating Ross on his accomplishments and wish him luck on his future endeavors! 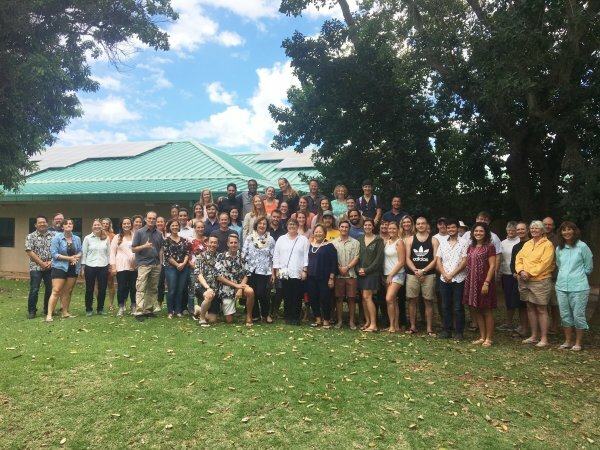 Post-doc Dr. James Guest led a seminar at the NOAA Inouye Regional Center on January 11th titled "Long term benthic community dynamics on highly urbanised coral reefs". 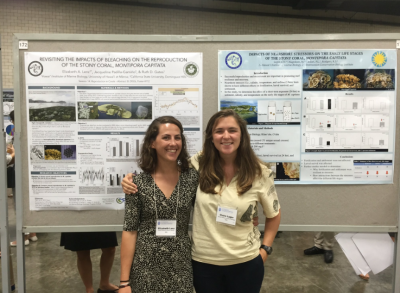 PhD students Shayle Matsuda and Ariana Huffmyer attended the 2017 Society of Integrative and Comparative Biology meeting in New Orleans, LA to present the results of their research. Additionally, Shayle led a Sketchnotes workshop. Great job, Shayle and Ariana! ecosystems using a combination of selective breeding, proteomics and innovative translocation techniques. James will be missed as he relocates to Newcastle University (England) in 2017, but we look forward to learning more about his advancements in this exciting field! 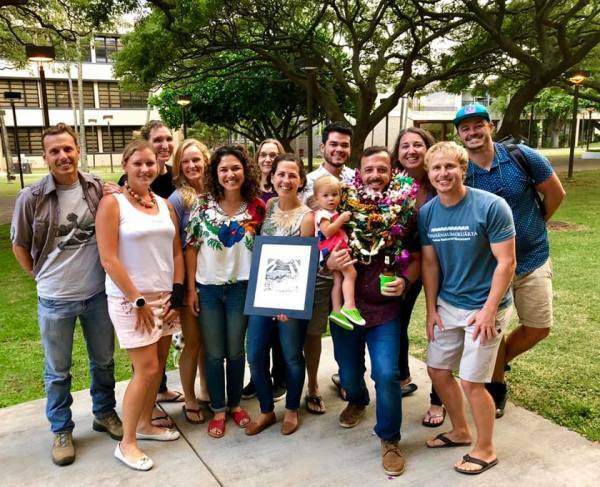 Congratulations to Gates Lab PhD candidate/students Chris Wall, Beth Lenz, Shayle Matsuda, and Ariana Huffmyer for receiveing research support from the Hawaii Institute of Marine Biology Colonel Willys E. Lord, DVM & Sandina L. Lord Scholarship Fund! Chris and Ariana also received the UH Manoa Department of Biology Charles H. and Margaret B. Edmondson Research Fund. Well done! Gates Lab PhD candidate/students Chris Wall (top left), Ariana Huffmyer (bottom left), and Beth Lenz (right) presented scientific talks and posters at the 100 year anniversary meeting of the Western Society of Naturalists in Monterey, CA. 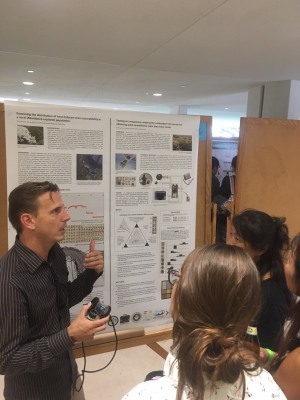 They discussed results of their research on coral energetics under light and CO2 conditions, parental effects on juvenile development in warmer temperatures, and the consequences of differential bleaching responses on sexual reproduction. 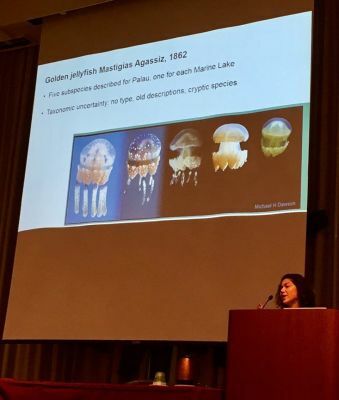 This year's meeting emphasized the value of natural history, observation, effective communication, and community and was a great oppportunity for the Gates Lab students to learn about recent advances in the field. Chris Wall, a PhD candidate in the Gates Lab, was featured on the "Youth Voices: Eco-Stewards" feature on the collaborative IUCN-East West website in advance of the 2016 World Conservation Congress held in Honolulu, Hawaii in September. Congrats, Chris! Read more about Chris' work and other Youth Voices here: icunyouthvoices.org . 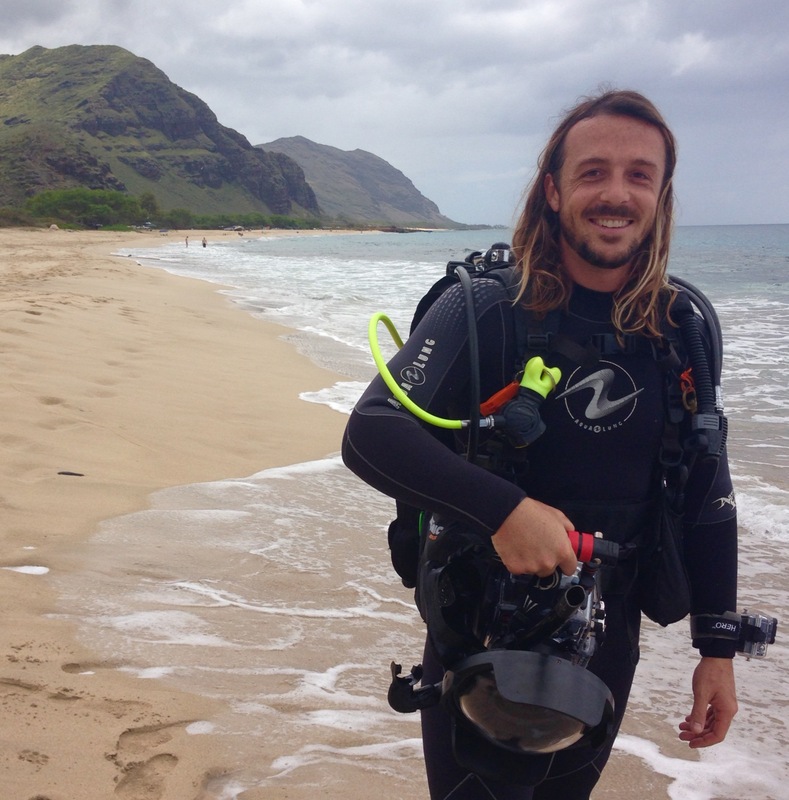 PhD candidate, Chris Wall, was awarded the prestigious Denise B. Evans Fellowship in Oceanographic Research through the Hawaii Institute of Geophysics and Planetology at UH Manoa. Congratulations and well done, Chris! The Gates Lab would like to recognize and thank Dr. Hollie Putnam for her enormous contributions to the Gates Lab during her time as a PhD Student and Post-Doc. She has greatly advanced the research program and continues to be an asset to the team. 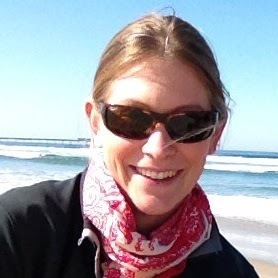 Dr. Putnam is briefly joining The Roberts Lab at the University of Washington as a Post-Doc ( https://faculty.washington.edu/sr320/ ) until she begins her position as an Assistant Professor in the Department of Biological Sciences at the University of Rhode Island ( http://web.uri.edu/bio/hollie-m-putnam/ ). Please join us in congratulating Dr. Putnam on her new positions and wishing her all the best! We look forward to continuing our collaborations with you, Dr. Putnam! 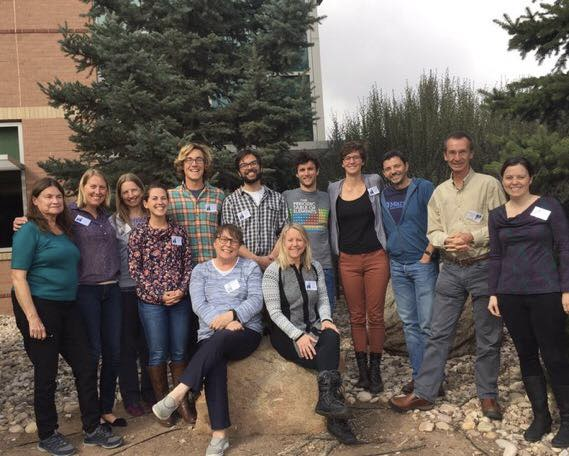 Dr. Ruth Gates, Post-Doc James Guest, PhD Student Beth Lenz, and former Post-Doc Dr. Hollie Putnam participated in a dynamic working group focused on understanding tropical coral reef resilience at the USGS John Wesley Powell Center for Analysis and Synthesis in Fort Collins, CO.
(back) Andreas Andersson, Kevin Gross, Satoshi Mitarai, Peter Edmunds, Hannah Nelson, Lauren Toth, Britt Parker, Ilsa Kuffner, (middle) Peter Mumby, Ruth Gates, Beth Lenz, Hollie Putnam, (front) Robin Elahi, James Guest, and Iliana Chollett (not featured: Caroline Rogers). 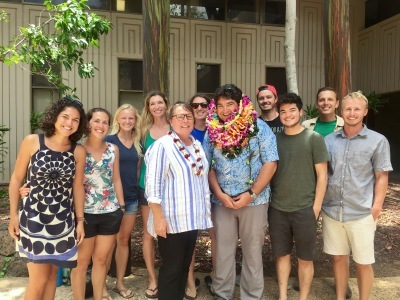 Dr. Ruth Gates (bottom right) along with students and post-docs of the Gates Lab (including Dr. Hollie Putnam, Dr. Katie Barrot, Dr. Ross Cunning (top left), Raphael Ritson-Williams, John Burns, Shayle Matsuda (top right), Beth Lenz (bottom left), Jessica Sevilla, Dr. Rom Dizon, Chris Wall, and Ariana Huffmyer) presented excellent talks and posters showcasing their research at the 13th International Coral Reef Symposium in Honolulu, HI. Congratulations to all members of the Gates Lab for a successful conference! 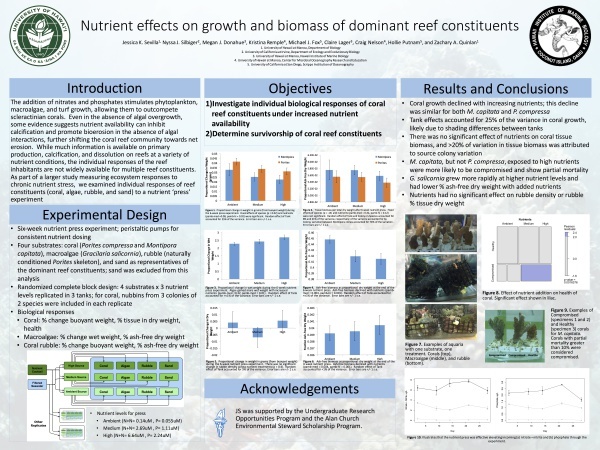 Jessica Sevilla, an undergraduate student in Marine Biology and a Student Sustainability Fellow at the University of Hawaii at Manoa, received First Place for her poster in the UHM Natural Sciences Undergraduate Showcase! Jessica is currently conducting research in collaboration with the Gates and Donahue Labs. Congratulations! PhD student Shayle Matsuda attended the Provasoli-Guillard National Center for Marine Algae and Microbiota (NCMA)'s 2016 Algal Culturing Techniques Course at the Bigelow Laboratory for Ocean Sciences Research and Education, in Boothbay, Maine in May 2016. 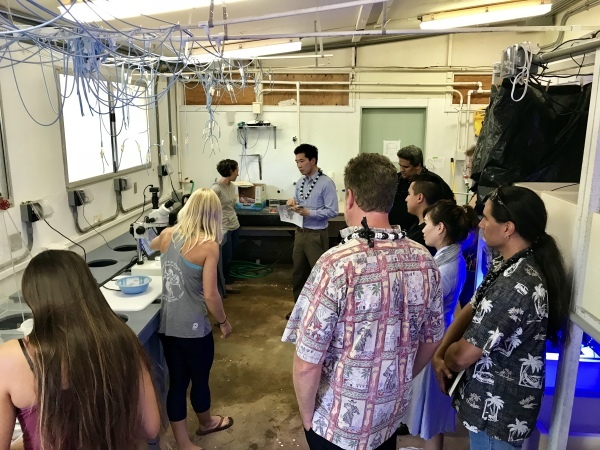 At the week-long hands-on course, he gained a strong foundation on a broad range of topics including algal taxonomy and identification, culturing and preservation techniques, and collection and isolation methods, all skills he will use during his dissertation work at HIMB. Congratulations to Gates Lab PhD candidate, Chris Wall, for receiving the prestigious EPA STAR Fellowship! 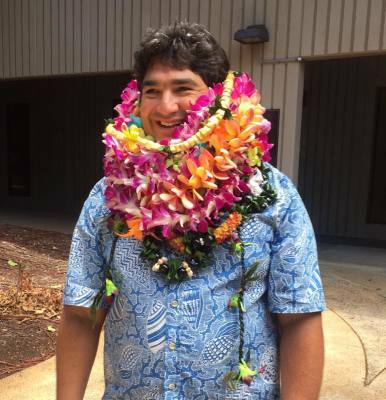 Gates Lab member, John Burns, successfully defended his PhD dissertation, "New insights into the biology and ecology of Hawaiian corals enabled by 3D reconstruction technology". Congratulations Dr. Burns! 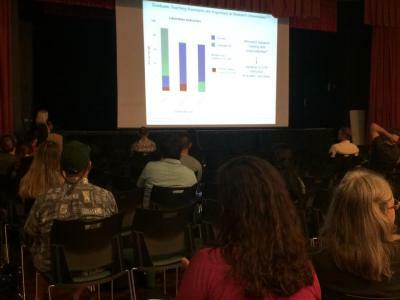 Gates Lab PhD candidates and students participated in this years UH Manoa Albert L. Testers Symposium. Raphael Ritson-Williams, Chris Wall, Elizabeth Lenz, Shayle Matsuda, and Ariana Huffmyer gave excellent talk and poster presentations on their research. And congratulations to Gates/Lemus Lab PhD student, Ariana Huffmyer, for being awarded best graduate poster and rapid fire talk! Congratulations to Gates Lab and Lemus Lab PhD student, Ariana Huffmyer, for being selected as a 2016 National Science Foundation Graduate Research Fellow! Maui surfer, Torsten Durkan, partnered with the Gates Lab in his "Surfing Be Cause" campaign, a mission to fight coral bleaching by raising money for every foot of the tallest wave he caught during this El Nino winter season. 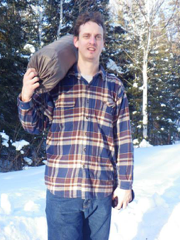 To read more about Torsten and his campaign, click here! 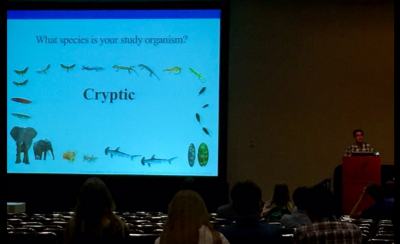 Gates Lab members Dr. Hollie Putnam, Raphael Ritson-Williams, and Shayle Matsuda attended the 2016 Society for Integrative and Comparative Biology in Portland, OR to present the results of their research. Gates Lab alumni and recent PhD graduate, Maggie Sogin, will begin a post-doctoral position at the Max Plank Institute for Marine Microbiology in the Symbiosis group with Dr. Nicole Dubilier. Good luck Maggie! 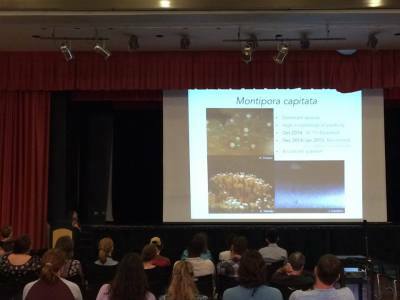 Ruth Gates and Ross Cunning attended the Moorea Coral Reef LTER annual All Investigators Meeting at UC Santa Barbara. 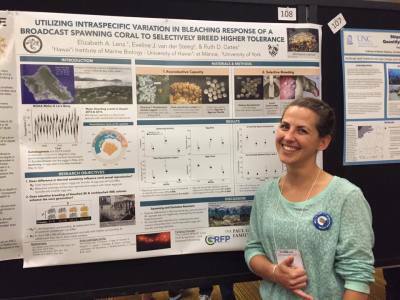 PhD student, Beth Lenz, travelled to the Western Society of Naturalists meeting in Sacramento, CA to present her research on the impacts of coral bleaching on reproduction. A new paper by Drs. 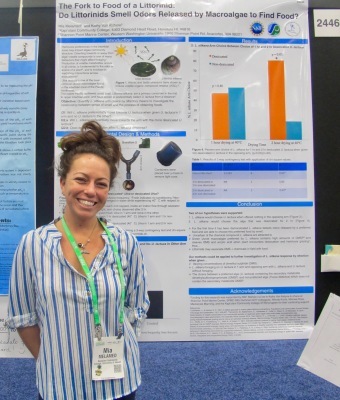 Hollie Putnam and Ruth Gates on transgenerational acclimitization and epigenetic potential in corals was published and featured in the Journal of Experimental Biology. Gates Lab coral spawning research and bleaching surveys are in full swing. Dr. Ross Cunning traveled to the USVI for collaborative work with the Edmunds Lab. Alum Dr. Jackie Padilla-Gamiño returned to the Gates lab for several weeks of research. 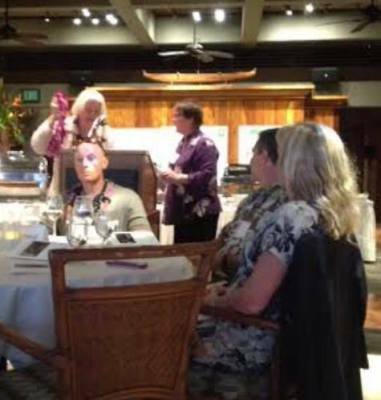 Dr. Ruth Gates was awarded the Honolulu Chapter ARCS Foundation Scientists of the Year. Maggie Sogin defended her dissertation. Congratulations Dr. Maggie Sogin! 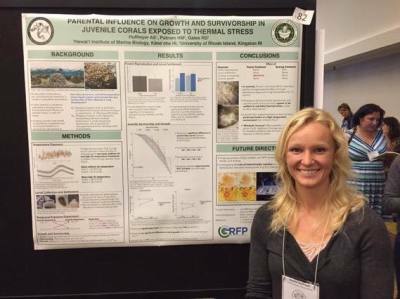 Hollie Putnam attended the 44th Annual Benthic Ecology Meeting in Quebec and presented research entitled "Corals in a changing climate: A trans-generational perspective". Congratulations to Robert Mason on his productive year as a Fulbright scholar! Aloha and a hui hou Robert! 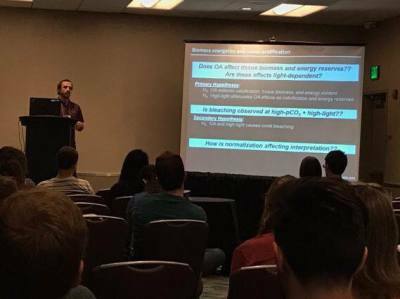 Raphael Ritson-Williams presents research at SICB titled "Coral recruitment in a high CO2 environment: A trans-generational perspective". Congratulations to John Burns and Raphael Ritson-Williams on being awarded prestigious EPA STAR grants to fund their dissertation research! Dr. Ruth Gates and Maggie Sogin travelled to UC Santa Barbara to present research at the MCR LTER All Investigator Meeting. Congratulations to Raphael Ritson-Williams on passing his oral exams and advancing to candidacy! 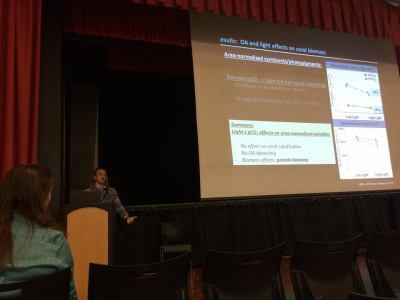 Raphael Ritson-Williams, Chris Wall, and Beth Lenz presented their research at the 95th annual meeting of the Western Society of Naturalists in Tacoma, Washington. 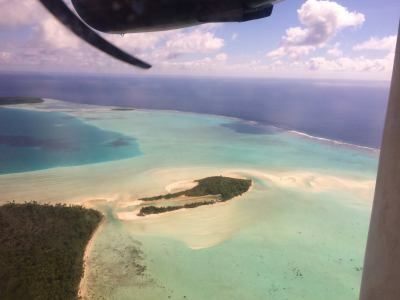 Dr. Gates visited Tetiaroa Atoll and Moorea in French Polynesia for meetings. 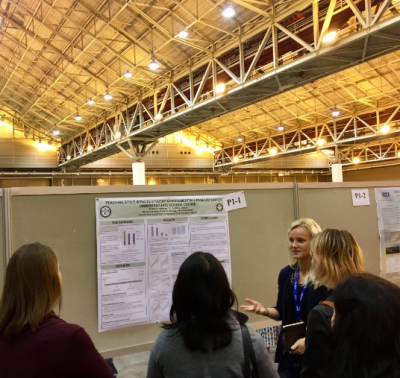 Congratulations to Dr. Katie Barott for her award-winning presentation at the American Physiological Society Meeting. Katie won the Comparative and Evolutionary Physiology Section Scholander Award for outstanding young investigator presenting their work at this meeting. We are delighted to welcome Dr. Katie Barott to the lab. 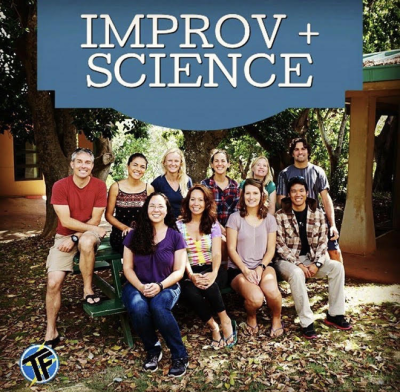 Katie is part of the Tresguerres Lab at Scripps Institute of Oceanography and will now be based in Hawaii conducting collaborative research in the Gates Lab. 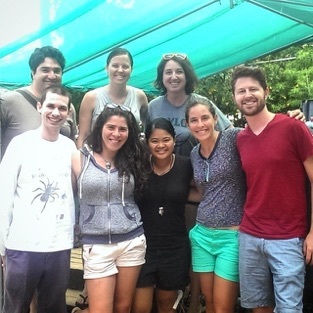 A new semester is here, and new coral recruits have joined the Gates Lab! 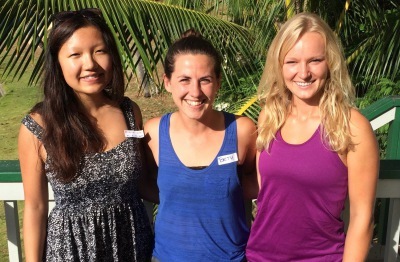 Welcome and aloha to our new Marine Biology Ph.D. students: Elaine Luo, Beth Lenz, and Ariana Huffmyer. Drs. 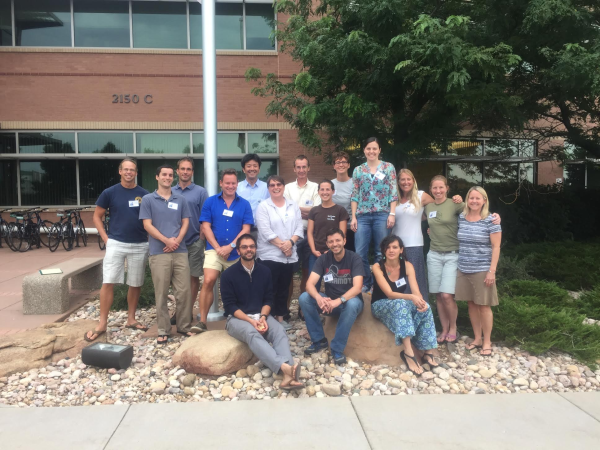 Ross Cunning and Laura Nunez Pons participated in the "Strategies and Techniques for Analyzing Microbial Population Structures" course at MBL. Jolly Ann Cruz, visiting undergraduate from Saipan, completed her Undergraduate Research and Mentoring project in the Gates Lab. Congratulations Jolly Ann! 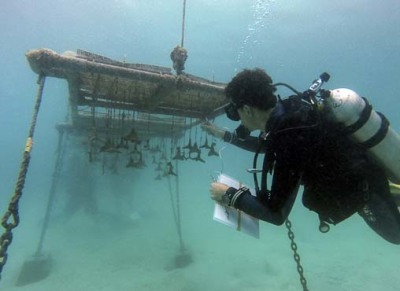 Dr. Diane Adams of Rutgers University visited for work on Montipora capitata spawning. 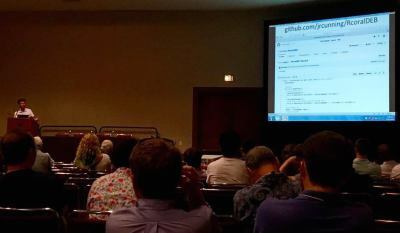 Dr. Ruth Gates participated in the Brown Dog Early User Workshop sponsored by the National Center for Supercomputing Applications and the National Science Foundation. A group of researchers led by Dr. Virginia Weis and Dr. Simon Davy visited the Gates Lab for Fungia sp. spawning work. Lab Alum Dean Vik started his Ph.D. in Dr. Matt Sullivan's lab at UA studying viral interactions with bacteria and archaea in OMZ's. Congratuations Dean! Dr. Ruth Gates traveled to Moorea, French Polynesia as part of the MCR LTER to participate in the filming of Hawaii Sea Grant's " Voice of the Sea " and to work with Cliff Kapono on his short documentary film that looks to highlight the importance of native culture in modern research entitled "'Ike". Dr. Ruth Gates traveled to Monterey for the "Pew Fellows Program in Marine Conservation/Herbert W. Hoover Foundation Workshops on genomics and climate change Hopkins Marine Station, Monterey, California. May 26-28. Gates lab alum, Dr. Xavier Pochon, published a paper in PeerJ titled " Multi-gene analysis of Symbiodinium dinoflagellates: a perspective on rarity, symbiosis, and evolution ". Gates Lab research on Assisted Evolution in Corals was featured on KITV News . Dr. Ruth Gates was awarded the 2014 Board of Regents Medal for Research Excellence . 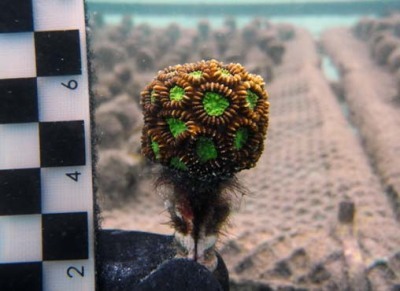 Gates Lab Research on Climate Change Adaptation and Corals was featured in Nature . 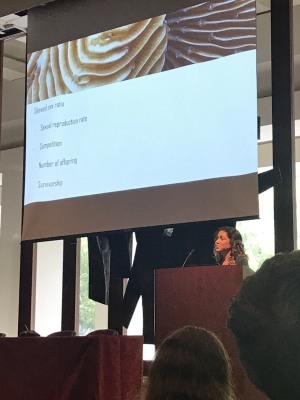 Dr. Ruth Gates traveled to SESYNC for the third meeting in a series of four targeted at " Solving the mystery of marine protected area (MPA) performance: linking governance, conservation, ecosystem services, and human well being" . 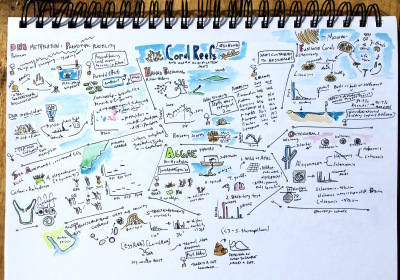 Dr. Ruth Gates traveled to Oxford to participate in the fourth Genomic Observatories Network Meeting , at Pembroke College, Oxford and the Second meeting in the Moorea Island Digital Ecosystem Avatar (IDEA) Workshop Series . Congratulations to John Burns on being selected as one of the finalists for the Rolex Awards for Enterprise . 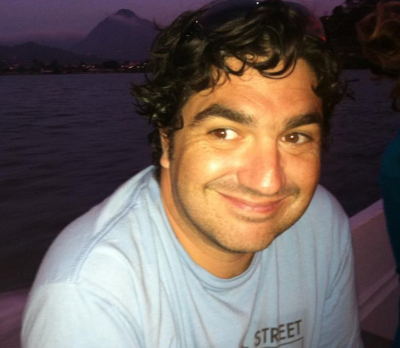 Congratulations to John Burns on his Tester Symposium win. John won one of the three Best Paper awards for his talk titled "Structure-From-Motion Photogrammetry: An Innovative Technique for Quantifying 3-Dimensional Characteristics of Coral Reefs". The Gates Lab was represented by Maggie Sogin, John Burns, Chris Wall, and Raphael Ritson-Williams at the 2014 Tester Symposium . They each presented talks on their current research. See Ruth discuss the " State of Hawaii's Ocean Waters " on PBS Hawaii Insights. 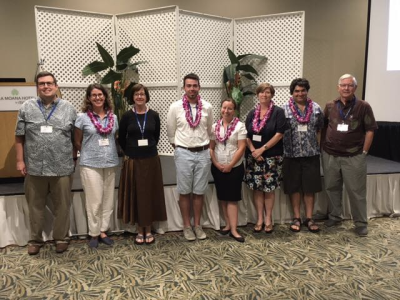 The Gates Lab and visiting researchers presented at the 2014 Ocean Sciences Meeting in Honolulu. We are delighted to welcome Raphael Ritson-Williams to the Gates Lab. Raphael joins us to complete his PhD at UH Manoa. We are delighted to welcome Dr. Ross Cunning to the Gates Lab. Ross joins us after finishing his PhD at the University of Miami RSMAS. He will be working with the EPSCoR Hawaii ECOGEM team. Drs. 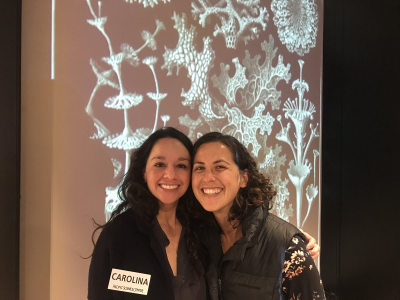 Ruth Gates and Hollie Putnam traveled to Rutgers University to participate in a workshop titled “ Comparative genomic approaches to understanding the architecture of metazoans ”. 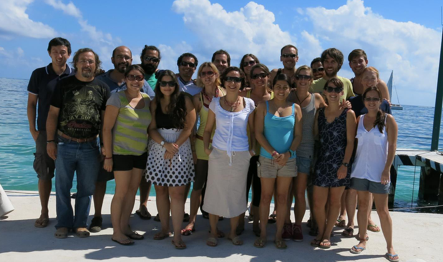 Dr. Laura Núnez Pons and Maggie Sogin participated in the “Light and Photosynthesis on Coral Reefs” course at UNAM .